Things have finally wound down for one of the world's largest motorcycle trade shows and the motorcycle world is buzzing over all the new bikes and ideas the week brought. Held in Cologne, Germany, the Intermot show draws more than 200,000 visitors and is usually the place where a number of new models are revealed. This was the show's 50th year and it did not disappoint. Dozens of new models from the world's major brands were announced, along with a number of fascinating updates on existing models. The show is, of course, targeted at the European market, so it's possible that some of the models announced will never be seen in the United States. Tastes tend to vary considerably on opposite sides of the Atlantic, with the U.S. market being dominated by cruisers, and Europeans seeming to prefer sportier machines. However, certain facts and ideas can be gleaned from Intermot, since it's usually the case that technologies and philosophies eventually find their way into all facets of motorcycling. Indian revealed the European-spec version of its new, critically acclaimed Scout. The primary difference in the Euro version is that it will be offered with anti-lock brakes as standard. That makes sense; ABS will be required in the European Union from 2016. The obvious take away from this difference is it almost certainly means ABS will also be an option for U.S. riders soon. Expect it to remain just that, though: an option. Adding anti-lock brakes seems to push the Scout well away from being able to compete price-wise with the Harley-Davidson Sportster 1200. This despite the fact that Harley-Davidsons also have ABS as standard in Europe. In the United Kingdom, for example, the starting price for a Sportster is £9,270 (or US $15,026). the new Indian Scout, however, will cost £10,399 (or US $16,856). Indian's Polaris family sibling, Victory, announced its 2015 model year line up for Europe, which is almost exactly the same as the line up in the United States except in two aspects. Firstly, the Boardwalk, Judge and Hammer S will live on for another year. These models have been discontinued in the United States. Secondly, and arguably of more interest, Europe will finally get the bobber-styled Gunner. One of Victory's most popular models in the United States, it had been conspicuously absent from European offerings. Most notably, the Gunner will feature anti-lock brakes as standard. As with anti-lock brakes on the Indian Scout, expect this feature to be offered as an extra in the United States. Expect it to also be made an option on all of Victory's line up within the next year or so. California-based Zero announced a number of improvements to their existing line up, including ABS, Showa suspension and Pirelli tires. Of interest to most potential riders, however, Zero claims to have boosted range some 10 percent. Zero says its S and SR models are now capable of a respectable 184 miles in the city, and 94 miles on the highway. Prices, unfortunately, have not gone down. The Italian motorcycle manufacturer announced the Caponord 1200 Rally: a version of its existing Caponord that's been given an offroad appearance. The German company revealed three new models at Intermot: the R1200R, the R1200RS and the S1000RR. All are of sport lineage. The R1200R and R1200RS are respectively naked and faired bikes powered by a liquid-cooled boxer twin. Both are shaft-driven and come dripping with techno bells and whistles. Meanwhile, the S1000RR is a roaring inline-four sportbike churning out nearly 200hp. The Italian company delivered one of the most talked about machines of Intermot. Tapping into the modern craze for nostalgia, hipsterism and "offroad" bikes that should never be taken off the road, Ducati revealed a delightful-looking Scrambler model (pictured above) that pays homage to its Scrambler line that was discontinued almost 40 years ago. The bike's 803cc air-cooled V-twin kicks out a purported 75hp, comes with LED lighting and anti-lock brakes as standard, has a USB plug under the seat and will be offered in four variations. 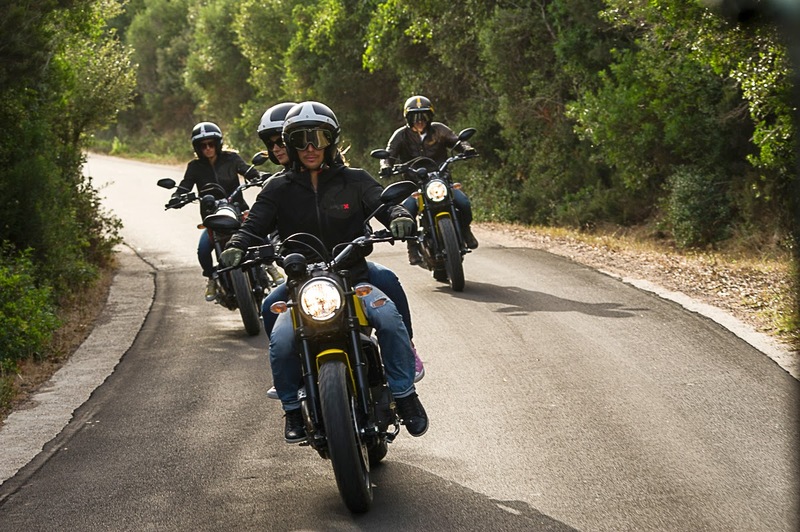 Expect the Ducati Scrambler to seriously compete for hispter love over the comparatively wheezy and outdated Triumph Bonneville Scrambler. There is talk that Big Red has some very exciting things in the works, but they weren't revealed here. Honda's only new offering at Intermot was an updated Crossrunner –– another don't-take-it-off-the-road offroader powered by Honda's formidable VFR800 engine. There's no word on when or even if this machine will make it to U.S. shores. In a classic example of climbing Mt. 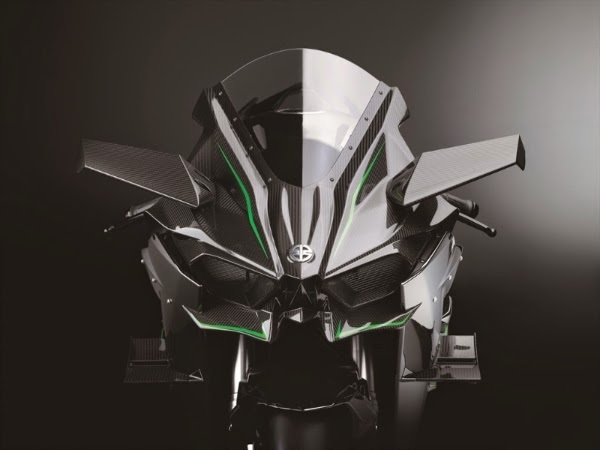 Everest just because it's there Kawasaki announced the demon-like Ninja H2R (pictured, right). Looking like something dreamed up by Satanic robots and featuring a seat that is clearly designed to help prevent the rider from being flung off the back, this super-charged 998cc inline-four produces roughly 300 horsepower. Yes, you read that correctly: 300 hp! Goodnight, Irene. Americans eager to see this beast in the flesh will be able to do so when it comes to the AIM Expo in Orlando later this month. Meanwhile, for us mere mortals, Kawasaki also released the Versys 650 and Versys 1000: updated and considerably less ugly versions of their venerable adventure-touring machine. The Austrian company that famously made the mistake of not lending bikes to Ewan McGregor continues to impress fans of monstrously large "adventure" machines with its new 1290 Super Adventure R. Delivering 160 hp and more than 100 lb.-ft. of torque, the Super Adventure R proclaims itself to be the "world's safest motorcycle" and comes equipped with one of the best braking systems anywhere. Also introduced was the KTM Freeride E Supermoto, an electric truly offroad machine that is currently not slated to be offered in the United States. Like its Italian countryman Ducati, Moto Guzzi levelled a shot at the Triumph Bonneville by updating its popular V7 series. The V7 II, in Stone, Classic and Racer variants, offers the same "modern classic" looks as existing V7 bikes but adds anti-lock brakes and traction control. Additionally, the ergonomics have been altered slightly to allow more legroom for taller riders. Suzuki has been going through a rough patch for a few years, seeing a restructuring in the United States and often struggling to be among the top ten sellers in Europe, but the company is making a valiant effort to come back by revealing five "new" models: the GSX-R1000, the GSX-S1000, the GSX-S1000F, the Bandit 1250 S, and the V-Strom 650 XT. Critics will point out, however, that all of these models are effectively different paint and bodywork on long-standing platforms. The Bandit's motor, for example, is essentially a throwback to the 1980s. 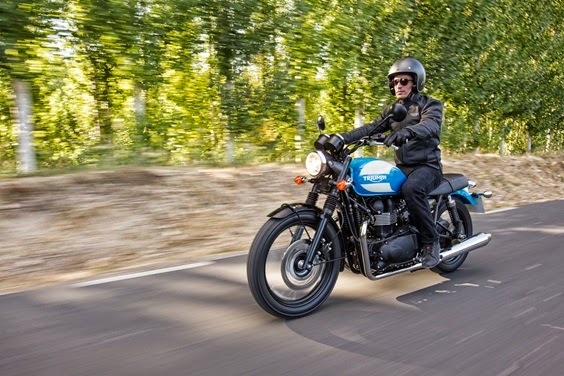 While its competitors in the modern classic genre are rolling out ABS-equipped machines, Triumph has opted to keep the Bonneville essentially untouched for 2015. However, it has unveiled a number of attractive versions of that platform: the Bonneville Spirit (pictured, right), the Bonneville T214 and the Bonneville Newchurch. All appear to be exactly the same machine offered by Triumph since the last major upgrade in 2006 but with slightly different paint, wheels, seats, etc. Keeping with the theme of aesthetic-only changes, Triumph also revealed the Street Triple RX -- a normal Street Triple with bits of a Daytona 675 slapped on. Stealing a page from the Triumph playbook, Japanese manufacturer Yamaha introduced the the XJR1300 and XJR13000R. These are just aesthetically modified versions of the beloved muscle sportbike that's been around since the 1990s. The XJR1300R is probably the more interesting of the two and features old-school cafe racer bubble fairing. Both styles have their roots in the modern new wave custom scene and are clearly targeted at the skinny-jeans-wearing crowd. It is unsure, however, whether the bike will be released in the United States. Yamaha also announced a variation on its popular MT-07 (known as the FZ-07 in the United States) with the MT-07 Moto Cage. Equipped with protective gear and a paint scheme that will feel a little embarrassing to anyone with a mortgage, the MT-07 Moto Cage is targeted at stunt riders. Wholly new from Yamaha, however, is the 01GEN three-wheeled concept vehicle. With a side profile reminiscent of Honda's NC700X, the 01GEN's front two wheels are at the front and mounted to a system similar to that used on the Tricity scooter, which means a rider can lean into turns.